Happy Tuesday to you!! While it's almost time for Christmas, it really is time for Tuesday Morning Sketches!! This week is our Annual "Anything Goes" Challenge. That means you can create anything you want to share with us!! Also, this challenge will last for 2 weeks. That's right, you'll have until Sunday, Jan 4, to create something wonderful to share with us! This was really fun to make! The instructions can be found in THIS POST at Crescent Stampin'. I left off the handle, but made the box using the instructions there. My base is Cutmates CS. I used Neenah Desert Storm CS, Paper Studio Kraft Christmas DP. The image is FTHS December Stamp of the Month image... Christmas Spirit Birdbrain. So cute! I wrapped the box with burlap, cut the image with Spellbinders, added a Sweet n Sassy die cut snowflake, and a brad. On the lid, I added an EK Success punched snowflake, a large brad, and the sentiment. Our very own Melissa is sponsoring this week with a gift card or shopping voucher. To where is a surprise, but I guarantee that it will be something you'll love!! I wish you all a very Merry Christmas!! It's my prayer that you know the Christ of CHRISTmas as you own personal Lord and Saviour!! 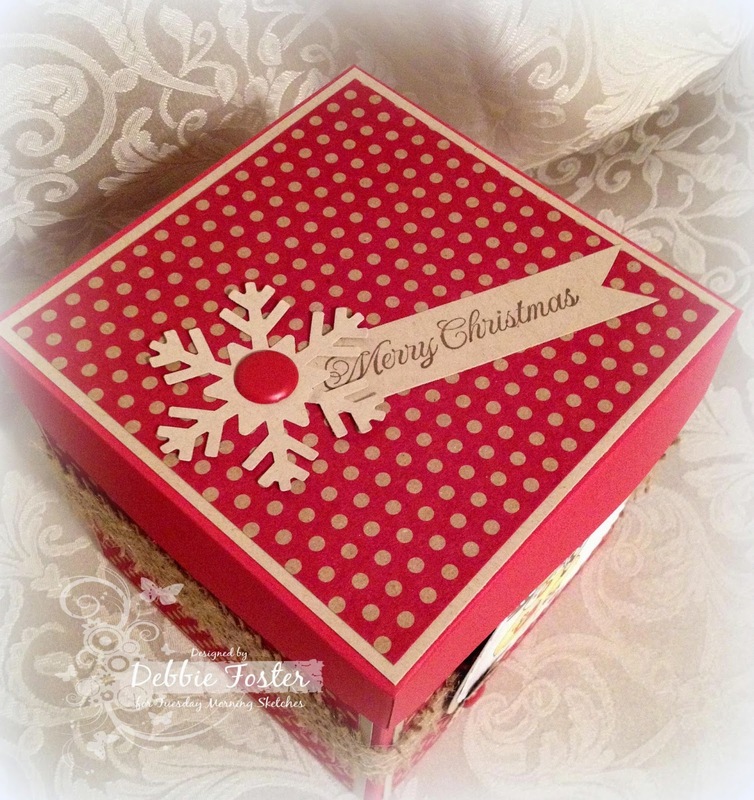 What a darling gift box design Debbie. Best of of the holidays. That image is SO CUTE! Your husband should love the image. 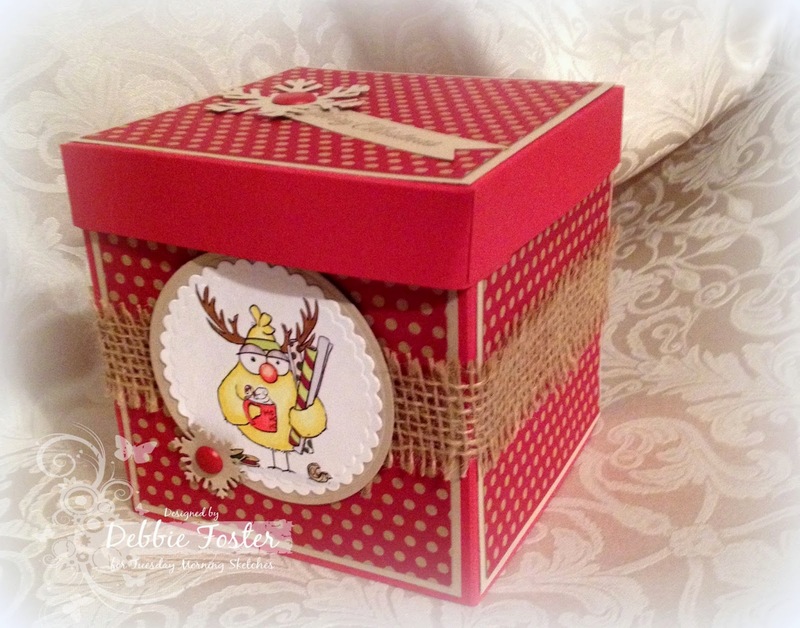 Very cute gift box, love the birdie image! Merry Christmas to you and your family! This box is wonderful, Debbie.! May you have a wonderful Christmas filled with all the blessings and love the season brings. Fantastic gift box Debbie! Thanks for the link to the instructions. Love the red and craft color combo and fun image! Wishing you a blessed and merry Christmas!! Adorable box. I like the burlap tied around it. Thanks for joining our SOTM December Challenge @ From the Heart Stamps !! I hope you & your family had a blessed Christmas together! Hi Debbie long time but want to thank you for stopping by my blog love this box and bet hubby got a kick out of it too....hope the real thing has arrived by now.....have a wonderful New Years. Dang! I thought I had already been around to visit my team's blogs and then I realized I haven't! I'm so sorry. But I love your box! So cute and I'm sure you're hubby loved it. Happy New Year! Fabulous creation! I love the fun image you used to decorated your box. Awesome work, Debbie.